This scholarship is in memory of Susan B. Martin who served as the first female president of the Idaho Chapter (1986-1987) and who was also a successful scientist and natural resource manager. Over the course of her life, she had a tremendous impact on the management of natural resources and an important influence on the development of many natural resource professionals. Susan passed away at the age of 57 on September 15, 2008, in Coeur d'Alene, Idaho, after a two-year battle with cancer. 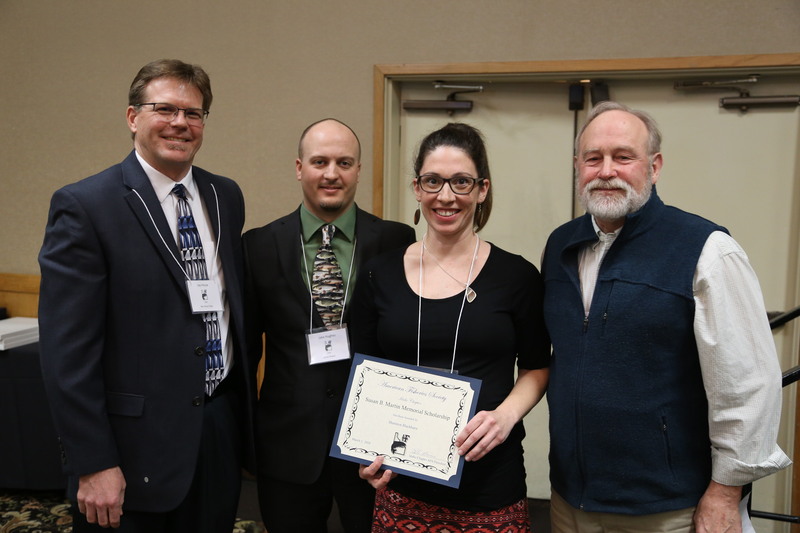 This scholarship, which was first awarded in 2009, is intended to continue Susan's legacy of fostering the development of fish and aquatic professionals and is awarded annually to a graduate student attending any school in Idaho. This scholarship is funded by an endowment which was created with contributions from the Martin family and the Idaho Chapter. Representatives of the Martin family and the Idaho Chapter Executive Committee present Joseph R. Benjamin with the annual Susan B. Martin Scholarship at the 2018 Chapter meeting in Boise. Left to right: Jay Hesse (2018 ICAFS Past President), Jake Hughes (Public Education Committee Co-Chair), Shannon Blackburn (University of Idaho graduate student), and Don Martin (Susan's husband), .